Wembley here we come! 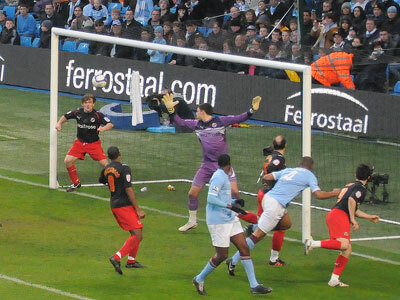 A tough tie with Reading ended with just a single goal - a great header from Micah Richards in the second half. Reading made it an open game and while they failed to keep Joe Hart very busy they had a fair amount of possession and there was always a chance of a surprise as City failed to make the best of the chances that came their way. The young Reading keeper had a good game and saved them on several occasions. City played better than their midweek Europa Cup game in the Ukraine and have to make up the two goal deficit later this week. 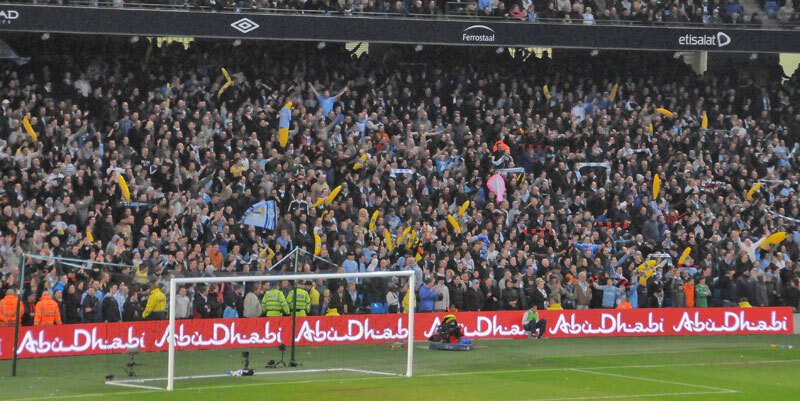 So it's going to be United at Wembley in April and as City have never met United at Wembley it will be a special occasion. 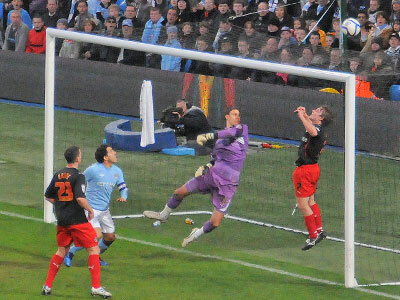 We have met United in a semi before. Back in 1926 at Bramhall Lane when we won 3-0 only to lose to Bolton in the final. 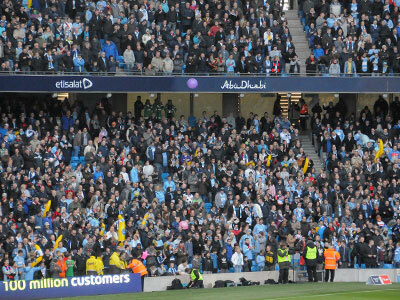 With Reading failing to take up their supporter full allocation the City regulars of the South Stand were able to take their usual places unlike the third tier! 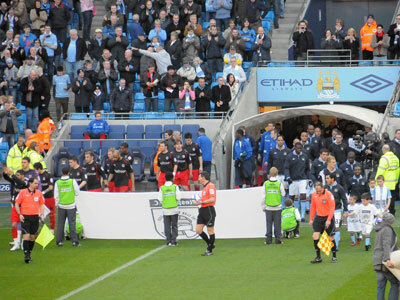 The Poznan went round the ground and here is the North Stand's effort. It now seems to be part of City culture. 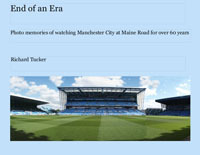 Can't wait to see it at Wembley! 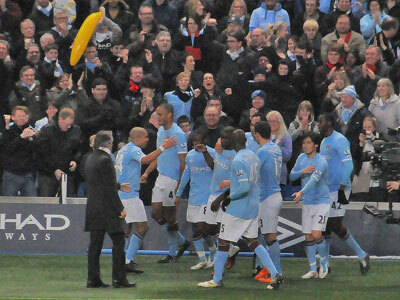 .....who also saves the follow up by Silva. 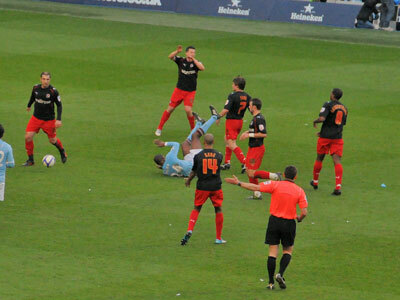 Patrick Viera goes down after a foul. Gosh! 6 Reading defenders to watch him! 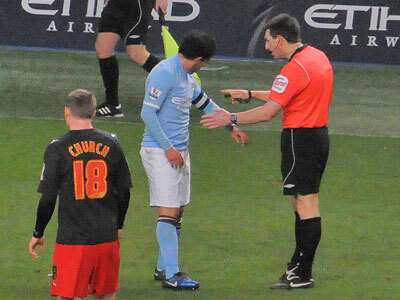 Referee Probert reminds Tevez that he is captain and to stop being naughty!